March 22, 2018 from 6:15 p.m. to 8:45 p.m. In this seminar, we will critically explore and theorize “hacktivism” as a form of revolt. Traditionally, hacking and hacktivism have been associated with anarchist-leaning attacks on the establishment. They have often been linked to radical Leftist forms of truth-telling and whistleblowing—to the hacker collaborative Anonymous, to WikiLeaks and Julian Assange, to Chelsea Manning and Edward Snowden. To be sure, as Gabriella Coleman emphasizes in her article “Weapons of the Geek,” we need to be more nuanced about the politics of hackers—as she correctly argues, “the ideological sensibilities that animate hacker politics are diverse: just as we can locate liberal hackers and projects, so too can we identify radical hackers and projects and see how both engender social change” (p. S98). But it is fair to say that the hacker sensibilities have tended to be predominantly on the Left. Emmanuel Goldstein provides a brilliant history in his essay on “Hacktivism and the Hacker Promise,” as does Coleman in her article. The political valence was linked, theoretically and historically, to what Coleman refers to as “the cultural cultivation of antiauthoritarianism” within hacker circles (p. S95). One looming question is whether things may be changing, at least in the public imagination. Hacking may be undergoing a type of ideological drift—no longer so tightly associated with resistance to power, and often, now, connected to more authoritarian political tendencies. If one had to identify a moment, a tipping point, it might be when Julian Assange threw his support, effectively, behind Donald Trump. The question this raises, then, is pressing: Have hacking and hacktivism drifted from a mode of resistance to merely a technology, a weapon? Has the ideological drift substantively transformed hacking from a modality of uprising to simply a technological tool? Another way to ask this is, does hacking still have a political or ethical valence, or is it now just like a machine gun or armored vehicle that can be used and deployed by any faction? 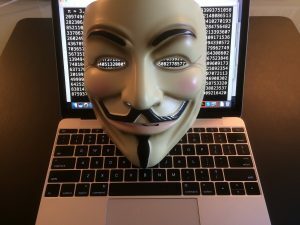 In his fascinating post, Emmanuel Goldstein defines hacktivism as “the subversive use of computers and/or computer networks to further societal/political change.” The question is, do we need to qualify the term “change”?